Out in Italy, at the monastery of San Marco in Florence, there’s a fabulous fresco of the Annunciation scene by Fra Angelico – I have a print of it on my bedroom wall. It is very striking. The angel is standing before Mary, and both of them appear to be in deep thought. I imagine it is that moment just after the angel has told Mary: ‘you are to conceive and bear a Son, and you must name him Jesus’. It’s like a meditation. Their heads are bowed, their hands overlapped in silent prayer. The enormity of what is happening is sinking in. In the 12th century Saint Bernard of Clairvaux wrote a beautiful reflection on that moment. He imagines the whole world gathered outside the room, looking in and awaiting Mary’s reply to the angel. They’re urging her to say ‘yes’ to God’s invitation. ‘You have heard, O Virgin, that you will conceive and bear a son… The angel is waiting for your answer… it’s time for him to return to God who sent him. We too are waiting, O Lady, …. the whole earth waits, prostrate at your feet…Answer the angel quickly, O Virgin’. And then, Mary lifts up her head; perhaps she smiles as she says her ‘Yes’! ‘Behold the handmaid of the Lord, be it done to me according to your word’. By saying ‘yes’, Mary gave God the greatest gift that humanity could ever have given Him – the gift of motherly love. Mary’s ‘yes’ invites us to reflect on our response to God’s call. It’s not easy nowadays to do God’s will. There are so many other attractions out there competing for our attention. Still, we are invited, in complete freedom, to say ‘yes’ to God as Mary did, over and over again. After the angel left her, Mary abandoned herself more and more to God’s will: as she visited Elizabeth, when she gave birth in a stable, at the Presentation of her child in the Temple, as she watched Him grow in knowledge and wisdom, when she listened to His public teaching and marvelled at His miracles and healing, as she watched Him gradually walking into danger. It is all there in the mysteries of the Rosary – the beads mark out Mary’s ‘yes’ after ‘yes’ after ‘yes’ to God. Luke tells us that Mary carefully kept all things in her heart. So, as we pray the Rosary, we can unite ourselves with her Immaculate Heart and enter with her into the great mysteries of our salvation. Blessed John Paul II encouraged us to see Mary as a ‘model of contemplation’ and to gaze on Jesus with Mary’s eyes, with the eyes of her heart! I like to reflect at each mystery of the Rosary on what Mary might have been pondering in her heart at that particular moment – for example at the moment of the Annunciation, or the Visitation, at the Carrying of the Cross, or the Crucifixion, at the Resurrection and Ascension, at his Baptism in the Jordan, or at the wedding in Cana … during each decade I think of how Mary kept renewing the ‘yes’ to God which she first gave as a young girl in Nazareth. Of course what sustained Mary’s continual ‘yes’ was her Immaculate Heart, overflowing with profound love for Jesus. No wonder Mary’s Immaculate Heart has been described as the ‘school of love’! Could there ever be a better teacher than Mary, to show us how to love God and say ‘yes’ to God in our lives? I wonder was it Mary who taught Saint John the beautiful words which he wrote in his first letter – ‘God is love, and he who lives in love, lives in God, and God lives in him’? Mary lived a vocation of love; she lived in God, and God lived in her! On this day, 25 years ago, Blessed John Paul II issued an encyclical about the dignity and vocation of women. In it, he described how women are living witnesses of the ‘vocation to love’. Women especially, he said, can teach us how to say ‘yes’ to God who is love. Today in Knock as we consecrate Ireland to the Immaculate Heart of Mary, I want to pay tribute to the women of Ireland who witness to love so strongly and so unselfishly. Let us give thanks for the mothers and grandmothers, the sisters and wives, the consecrated women, the married and single women who have built a ‘civilisation of love’ here in Ireland. They have been outstanding in their commitment to family and to faith and in the example they give of how to be understanding, forgiving, merciful, humble and caring. The women of Ireland have played the central role in handing on the faith in this country. They have been our chief evangelists, the educators and stalwarts of the faith. Thinking of my own mother, I venture to say that the women of Ireland are the best ‘pray-ers’ too! In many ways their witness to selfless love teaches us men how to be better fathers, brothers, grandfathers, husbands, single men, priests and bishops. I thank God especially today for the ‘yes’ that women give to unborn children. Like Mary, they become partners in God’s creation. They unselfishly say ‘yes’ to new life despite all the tiredness and discomfort of pregnancy, the soreness and nausea, the worries and disruption it can bring. Mary’s last recorded words in the scriptures are ‘Do whatever he tells you’. Do not be surprised, then, at the beginning of this Novena in Knock, if you hear God calling you today to do something significant and special for Him – something that will make a real difference to your life and in the lives of others. You will know God’s call when you hear it, because it will be definite and challenging. Do not be afraid! If you can answer, as Mary did, ‘I am your servant Lord, let it be done to me according to your will’, then God will give you all the grace you need to transform the world from within. ‘To transform the world from within’: that’s what Blessed Pope John Paul II asked of the Ireland’s lay faithful back in 1979. Today, Ireland is perhaps more than ever in need of transformation. This dear country of ours, which has proudly sent countless missionaries all around the world to spread the Good News of Jesus Christ, is itself ready for ‘new evangelisation’. Sadly, many of our people are losing touch with Jesus who is the Way, the Truth and the Life, and they are missing out on the joy and the hope that believing in Jesus can bring. Our mission, as true disciples of Christ, is to transform Ireland from within. We do this by gently inviting our brothers and sisters to a new friendship with Jesus, and by convincing them, as Pope Benedict put it, that when you let Christ into your life, you ‘lose nothing, nothing, absolutely nothing of what makes life free, beautiful and great’! Two weeks ago at Brazil’s National Shrine of Our Lady at Aparacida, Pope Francis said, ‘when the Church looks for Jesus, she always knocks at his Mother’s door and asks: “Show us Jesus”. It is from Mary that the Church learns true discipleship. That is why the Church always goes out on mission in the footsteps of Mary’. That is also why, to mark this Year of Faith, the Bishops of Ireland decided together in June to consecrate Ireland to the Immaculate Heart of Mary. Many of you had been encouraging us to do so. Thank you for that encouragement! 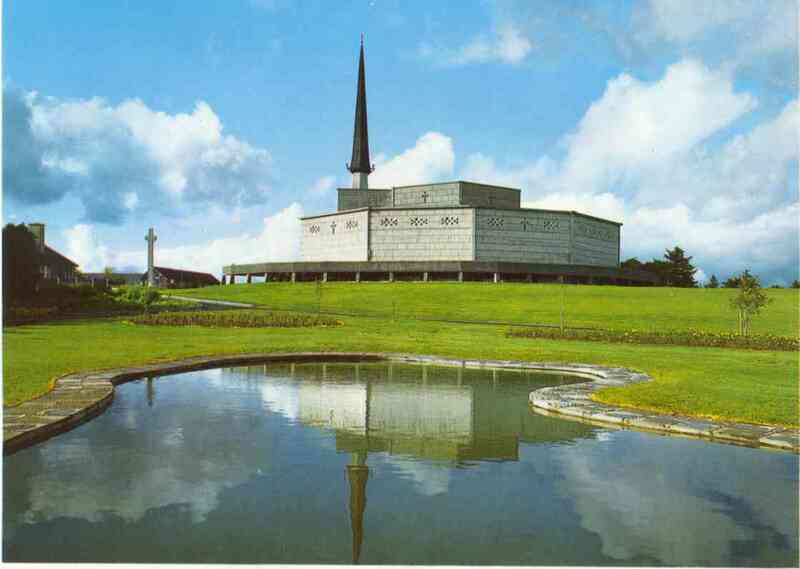 And what better place to perform this solemn Act than here in Knock, Ireland’s National Shrine to Our Lady! After all it was here, back in 1979, that Blessed Pope John Paul II last entrusted and consecrated the people of Ireland to Mary, Mother of Christ and Mother of the Church. To Jesus, through Mary! Those were the words which St Louis Grignon de Montfort used when he promoted consecration to Mary’s Immaculate Heart. Today, inspired by those words, we entrust ourselves completely to Mary and implore her intercession to help us keep our baptismal commitments and live as her children. Led by our cardinals, bishops and priests, in consecrating ourselves, our families, homes, dioceses and Ireland our country to Jesus through Mary’s Immaculate Heart, we are placing ourselves under her protection and asking for her maternal blessing. Of course a consecration such as this is not something simply done to us, or for us, which asks nothing of us in return. If we travel home from Knock today without a renewed commitment to God’s will in our own lives, then how can we expect this solemn and beautiful Act to make any difference at all? This entrustment asks for our ‘yes’ to God. It invites a continual conversion and giving of ourselves, an ongoing ‘yes’ to the values of the Gospel. It calls on us to say ‘yes’ again and again to our faith, to family, to respect for life, to charity, to forgiveness, to reconciliation. It calls on each one of us to live out our baptismal commitment so that everyone we meet, especially those who seem furthest away or most indifferent, can feel touched by the mercy and love of God. As we go out together in the footsteps of Mary, on this mission to announce the Gospel of the Lord, I encourage you to nourish your entrustment, your ‘yes’ to God, by praying the Rosary every day and regularly spending time before the real presence of Jesus in the Eucharist. There, bead by bead, mystery by mystery, contemplate Jesus with Mary. Gaze on Him with the eyes of her heart! To end, I’ll borrow Pope Francis’ prayer from Aparacida. ‘Dear friends, we have come to knock at the door of Mary’s house. She has opened it for us, she has let us in and she shows us her Son. Now she asks us to “do whatever he tells you” (Jn 2:5). Yes, dear Mother, we are committed to doing whatever Jesus tells us! And we will do it with hope, trusting in God’s surprises and full of joy’. A Mhuire na nGrás, a Mháthair Mhic Dé, go gcuiridh tú ar mo leas mé. Archbishop Eamon Martin is Coadjutor Archbishop of Armagh.